Blackjack has remained one of the most favorite and popular card games at brick and mortar as well as online casinos all over the world. The history of the game dates back to the 15th century and by the 18th century, blackjack became one of the most played card games in France. There are a few reasons why the game of blackjack receives far more attention than other card games that are played in casinos. One of the most prominent reasons is the level of entertainment offered by the game. The game has the potential to keep you hooked for a long time. Another reason is the number of variations that the game offers. Over time, many variations of the game have emerged making the game more challenging and popular amongst players. BlackjackPro Monte Carlo SH is a single hand blackjack game. The game is quite popular among players because of its exciting features, low bankroll requirements, and its impressive RTP. bCasino is a popular online casino in the United Kingdom. The casino has made a reputation for itself by offering an exciting collection of games including some of the most famous titles from topmost casino gaming software providing companies. You can play many variants of blackjack including BlackjackPro Monte Carlo SH. In addition to a large library of games, bCasino also offers a reliable and professional customer support in case you are stuck with any issue while playing games or while making payments. On the payment front, the casino offers popular and easy payment options to the players. The game developed by NextGen Gaming is based on the standard blackjack game with certain tweaks that make the game more interesting. For example, in other variations of the game, players are not allowed to split cards when they are dealt same value and not allowed to double down when cards with 9, 10 or 11 value are dealt. The game has low bankroll requirements and when played with proper strategy and techniques, can result in winning some impressive amount. Being developed by one of the most famous casino gaming software companies, Blackjack Pro Monte Carlo SH has all the good features you would want in the game of blackjack. Besides Single Hand version, a multi-hand version of the game is also available. In the single hand version, players can place bets in the range of $1 and $100 per hand. 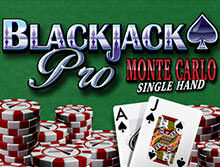 Blackjack Pro Monte Carlo SH features an exciting and invigorating interface that is fairly easy to grasp. The casino game developer has successfully tried to imitate the setting similar to a brick and mortar casino with dominant green color in the interface. Clicking on the game will load the game screen with the NextGen Gaming company’s logo appearing and then the game will load. If you are facing any trouble in loading the game then we would advise you to enable the flash player on your browser as the game requires flash player to work. On the game screen, you will see a green colored casino table, deck of cards, and chips giving some serious retro casino like vibes. On the top left side of the screen, you will see minimum and maximum bets that can be placed in the game and below that is the button named Game Rules. Clicking on this button will lead you to the rules of the game that are similar to standard blackjack games with certain twists to increase the level of entertainment. 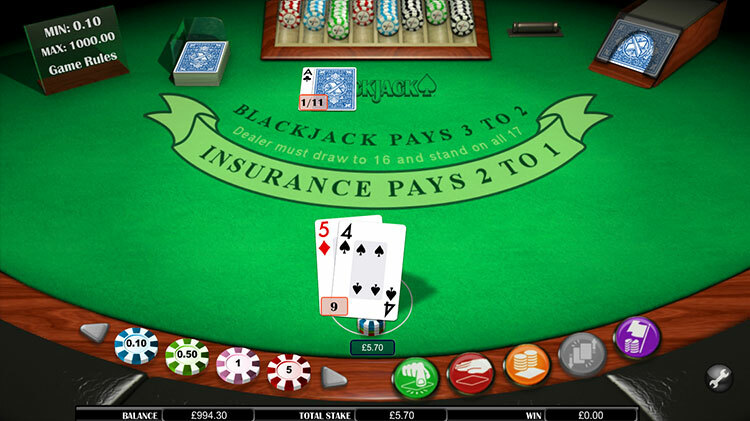 At the centre of the screen, you will see the name of the game along with some standard rules like “Blackjack pays 3 to 2”, “Dealer Must Draw to 16 and stand on all 17” and “Insurance Pays 2 to 1”. If you are someone who has played the game of blackjack before, you must be familiar with these rules already. Below it is the “Bet Here” button which is used for placing bets. At the bottom of the screen, there is a counter that displays your balance, total stake, and the amount you have won so far in the game. On the right side of the screen at the bottom, a wrench shaped symbol will appear. Clicking on this symbol will open game settings. From here, you can choose various game-related settings including Game speed, audio, and color. The game sets you right into the mood of a serious casino game with its smooth background music which is hardly noticeable but creates an atmosphere. You can play BlackjackPro Monte Carlo SH with six decks of cards with each deck having 52 cards. Jokers are not included in the game. Players have the aim of beating the dealer by collecting the highest value of cards but the value should not exceed 21. If you are successful in beating the dealer before reaching the value of 21, you will be declared as the winner of the game. For placing the bets in the game, you need to click on the “Bet Here” button and select the chips that are given on the left-bottom of the screen. All the cards in the game that are numbered between 2 and 10 carry their face value. The cards that are greater than 10 i.e. King, Queen, Ace, and Jack are valued at 10 points. On the other hand, the value of aces depends on the advantage to the player. Aces can hold one of the two values - 1 or 10. According to the rules of the game, the dealer dealing the cards must stand on all the 17s and the players are allowed to split a hand only once. Players will be allowed to split cards of the same rank. Participating players will be allowed to split a hand only once. If you have split aces then you will be allowed to add just one card. After a split has happened, an ace and a card with its value as 10 cannot form a blackjack. A split happens in a case where the first two cards that are dealt carry the equal value. Hands that are split are played individually. In such a case, each hand comes in turn after one card is provided to every hand. Double down happens in situations where the first two cards that are dealt carry the value as 9, 10 or 11. For a hand, double down is performed at the beginning of the bet. A double down feature is also applicable to split hands where the first two cards dealt are 9, 10 or 11. When a double down happens, a bet same as your original bet placed on that particular hand will be placed automatically. On a double down hand, only one extra card is allowed. The game offers the facility to double down on the split hands. Insurance happens in a situation where the face-up card dealt to the dealer is an ace. In case a player accepts an insurance offer, another bet carrying the value as the half of your initial bet is placed before the dealer’s hand is evaluated for blackjack. In case the dealer gets a blackjack, your insurance bet is declared as the winner. However, if the dealer fails to achieve the blackjack, your insurance bet stands lost. At the beginning of the game, two cards are given to each active hand. Out of the two cards, one card dealt to the dealer is face up as per the rules of the card game. Dealer’s hand is considered as completed after the hands of the participating players are finalized. The dealer’s blackjack takes all the bets besides a player’s blackjack. This move is termed as “push” in the game. You will find the payout written in bold on the game screen. As per the rules of the game, blackjack pays 3 to 1 and insurance bet pays 2 to 1. The theoretical return to player rate of the casino is 98.548%, which is evident of the fact that with the right strategy you can reduce the house edge and gain some impressive profits. Blackjack Pro Monte Carlo SH is an exciting game by NextGen Gaming offering a heavy dose of entertainment and excitement to the players. The game is fast paced and suitable for those who are running low on their bankroll. The game is a unique variation of the popular blackjack game. We strongly recommend this game to the novice as well as expert players. We assure that you will not be disappointed with the game.